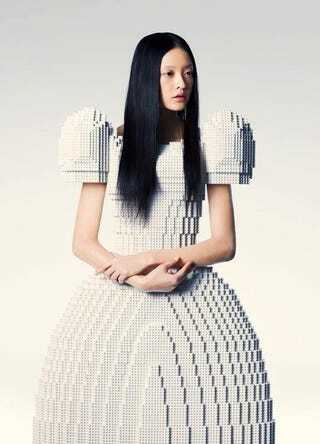 Japanese artist Rie Hosokai, of Daisy Balloon, created this amazing piece of high Lego fashion for Tokyo's "Piece of Peace" charity exhibit at the Parco Museum. Structurally it's simply stunning (albeit a bit Disney Princessy). The construction, contour and shape are based on Hosokai's balloon dress. As an item of haute couture, it's not so utilitarian. But as an avant-garde work-of-Lego-art it's simply stunning. There is fear in that we are all different from one another, but that is also the gateway to self-consciousness. Self-consciousness was once whole, but in the modern trend where all things whole get broken down, it too is about to get deconstructed. For that reason, people now seek to reconstruct their consciousness by extending it onto others. Through this process of extension, we have learned to unravel things down to their basic elements. We are succeeding at digging up new knowledge of what it is we all share. This knowledge that bonds different people together seems to appear suddenly, but in reality it is already coded into our planet, our universe. We construct things from the most basic building blocks. What are we to discover from this process? You're reading Leg Godt, the blog with the latest Lego news and the most awesome Lego models in the web. Follow us on Twitter.